Hay Bales Galore! Making the most of the good weather, I had a great day painting down at Newenden today. 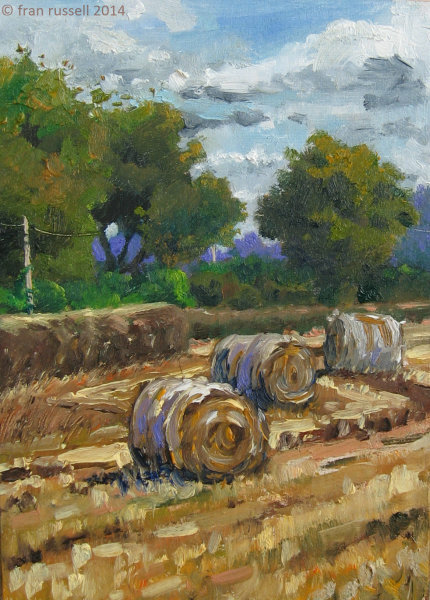 I went with the intention of painting the boats on the river, but due to restricted access because of works to the unstable river bank, I drove further down Lossenham Lane and came across lots and lots of lovely hay bales in the field beside the river. I took a selection of boards with me and really enjoyed myself, doing three small paintings. As always, lots of locals walking their dogs stopped to chat - it really is a lovely place to spend the day. 7" x 5". Oil on board.